Harald Erici, borned 1974, grew up on Öland, a Swedish island in the Baltic Sea. Surrounded by beautiful nature and animals, at his familys farm, he spend a lot of time exploring the piano. Seven years old Harald had his first piano lessons with an old lady in a neighbouring village. In primary school he took advantage of playing in several school orchestras and musical shows. But it was not until 1996 that Harald went for fulltime music studies. After two years of music and sound studies at Liljeholmens Folkhögskola he continued to study at Gothenburg Academy of Music and Drama. By the same time he formed Ida Olsson Quartett where he composed and performed songs with singer Ida Olsson. In 2000 Harald went for contemporary composition studies at Gotland School of Composition, including lectures by professor Sven-David Sandström. 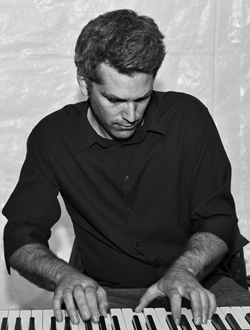 During a stay in Australia, working as a bar pianist, Harald collaborated with Australian producer and songwriter Jamie Durrant. Together they created the pop act Young Genius. Their first single, Song #1 (Bent Records, 2001), was immediately spread in 1 000 copies all over Australia. Back in Sweden Harald took a university degree in composition and arrangement, at Piteå School of Music. He also formed his own trio, Trio Erici, that released the album Jazz på Öländska (Erici Produktion, 2003). The record contained new ”jazzy” interpretations of traditional folk songs from Öland. Harald produced the CD, Hot Percussion (Piteå School of Music, 2003), together with percussionist Anders Åstrand (Kroumata) and Framnäs Percussion Group. He also scored theatre music for Kävlingeteatern (Den Goda Människan, 2002) and Västerbottenteatern (Ruben & Jag, 2003). In his C-extended essay, Brazilian Cannibalism and Songwriting (Piteå School of Music, 2005), Erici researched Brazilian Popular Music. He travelled the South- and the North East of Brazil to explore and learn more about styles as Samba, Bossa Nova, Choro, Maracatú, Baião and Forró. At the same time he began to record the conceptual album Brasilicum with nearly fifty participating musicans in Brazil, Sweden and Australia. Jaques Morelenbaum, Marcos Suzano, Marcelo Salazar, Diana Clark and Doug de Vries are some of them. In 2007 Harald made a special participation at J C Schütz´s album Blissa Nova (Terrinha Records, 2007), in the English version of Gilberto Gil´s Eu vem pra Bahia. The 8th of April Erici launched his album Brasilicum (Erici Music, 2008) in Rio de Janeiro. The release show had, amongst others, a special particiaption of Brazilian percussionist Marcos Suzano. Within Brasilicum Harald has created a foreign concept around Brazilian Popular Music that are yet to be performed not only in Brazil, but also in Europe and Australia. In 2011 Harald launched Stagnelius In Concert, an entire consert with new compositions to lyrics of Swedish National poet Erik Johan Stagnelius. He also went to Olinda, Brazil to complete a new album with Brazilian aritst Telmo Anum.